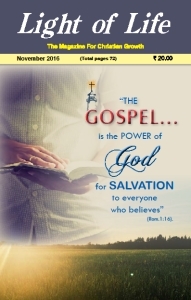 "Light of Life" is a monthly magazine published in India catering to the whole Christian family. The endeavour is to inspire, instruct, inform and influence people in becoming better followers of Jesus Christ. It provides a forum through a variety of articles and features where a Christian perspective is presented with a view to formulate Christian opinion in the country on matters of national and social significance. Editorial: Evangelism - False steps in this crucial ministry will build up a faulty foundation, warns Jacob Ninan. Maximum or minimum for the Lord - Zac Poonen emphasises that there is a vast difference between lives under the old and new covenants. Baal in the backyard - We cannot worship God, and at the same time, and hide sins in our life, warns J. Fredric Dawson. Ethics in the market place - Part-1 - Christians need to show a unity between words and deeds, challenges Peter Pothan. Predictably unpredictable! - The only one that does not change in this world is God, challenges Suresh Manoharan. Knowing God - Aasish Cherian points out that for every Christian it is necessary to have a knowledge of God and an experience with Him. To live is Christ and to die is gain - If we live with Christ there will be much for us to gain in death, says Daniel Sathiaraj. The art of dying - Samip Baruah exhorts us to live in such a way that our death will bear witness to it. Dealing with the doubt factor in your teens - Encourage the teen with doubts to keep asking questions, says Deepika Emmanuel Sagar.